View of Colney Chapel House in London Colney, Hertfordshire. London Colney is a large village sited on the old coaching route between London and St, Albans. The River Colne also runs nearby and these two elements combine to give the village its name. It is sometimes known as Colney St Peter. 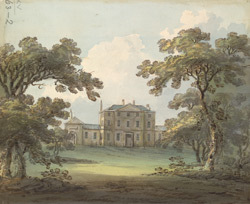 This print is a typical example of an item from the King George III Topographical Collection. The King was fascinated with the landscape, architecture and geography of Britain and collected maps, atlases and prints as well as original watercolour drawings of various locations around the British Isles.